The user must do some fix-up work whenever their login credentials are changed for one of the accounts or when the bank throws a curveball to the aggregation robots. It happens a lot and is one of the main reasons customers stop using aggregation services. PFM providers struggle with how best to educate and motivate users to stay on top of this routine maintenance. 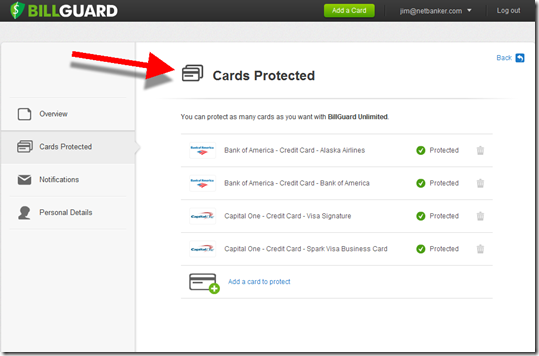 BillGuard uses a proactive approach that I like. When I recently changed the password on a credit card, the company sent me an email explaining that they were no longer able to access my transactions and that it was probably from a “change in the way the bank handled logins” (see first screenshot below). In my case that wasn’t true, so it would be helpful if BillGuard also mentioned that the cause could be a password/username change. Then the company did an excellent job walking me through the maintenance process and providing positive strokes at the end of the process, e.g., my card is now “protected” (last screenshot). 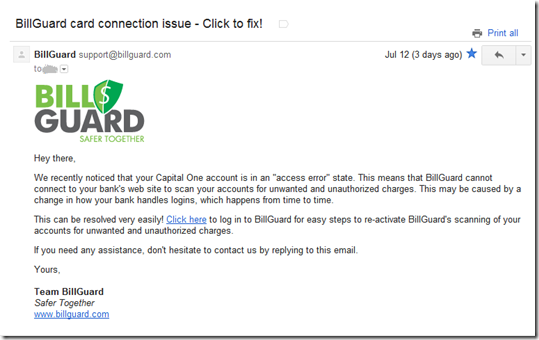 But I especially appreciated BillGuard’s extra effort during the aggregation process after I’d reestablished the login to my credit card. Since it was taking extra time to download the transactions, BillGuard asked if I’d like to continue waiting or close the session and have the results emailed to me (see second screenshot). Excellent customer advocacy! I’ve been looking forward to the day when financial companies would begin to leverage mobile phone location to fight payments fraud. 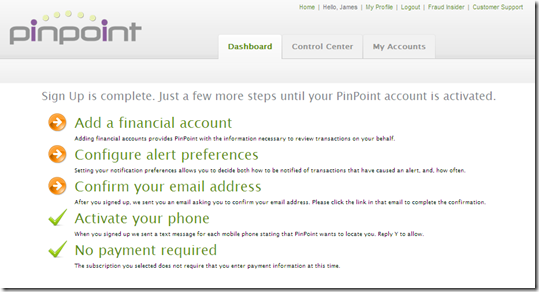 That day has arrived with the launch of Finsphere’s PinPoint which began its private beta a few hours ago. We have 100 invite codes if you want to test the service free of charge (enter “Finovate” in the Promotional Code box on the signup page). 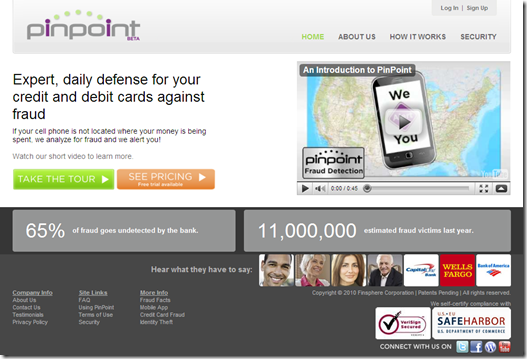 PinPoint is a subscription-based alert service that runs on top of online banking. Using Yodlee’s aggregation technology, PinPoint monitors all of the user’s card-based transactions, and sends email and text alerts on potentially fraudulent transactions based on a number of factors, one of which is the consumer’s physical location as indicated by the location of their mobile phone. Pricing has not been finalized. The addition of the consumer’s location is a huge help in identifying potential fraud and reducing false positives. Receiving fraud alerts from a single, trusted source with a consistent design and methodology makes it more likely that the consumer will actually pay attention and take action. The service provides contact info and help for reporting fraudulent transactions. PinPoint’s entire mission is to identify fraud and help the end-user avoid paying for it; while financial institutions have similar high-level goals, they also have competing priorities that sometimes get in the way. The startup also plans to connect the service to credit bureau data where it will compete with the credit monitoring players such as Experian, TransUnion, Equifax, Intersections and others (note 2). The demo videos show a mobile app, but that’s not part of the initial release. Finsphere is a Seattle-based startup that’s been operating in stealth mode since 2007. The company has raised nearly $20 million in two rounds from Bezos Expeditions, Mohr Davidow Ventures, Shasta Ventures, and Frazier Technology Ventures. The CEO and co-founder is Mike Buhrmann, a serial entrepreneur in the wireless/mobile space who originally worked at McCaw/AT&T. President Robert Boxberger is a former Wamu/Providian card exec (note 3). Until today, press reports have been limited to reports of its first two rounds of venture funding (see previous Netbanker post). The company had developed a broad range of patented technologies dealing with location-based fraud tools. In addition to the consumer service launched today, the company has its eye on enterprise fraud-management tools. 1. For more information on alerts, see the most recent Online Banking Report: Transaction Alerts & Streaming. 2. For more information, see Online Banking Report: Credit & Fraud Monitoring Services (August 2007). 3. Check out the company’s About page, where five top execs introduce themselves and provide a 60-90 second overview of the features and benefits of the service. A very good use of video. I check the Finance applications in the Apple iTunes store at least once per week to see which of the companies we track has posted an app. But I missed one of the most popular finance apps, because it’s categorized under Productivity. 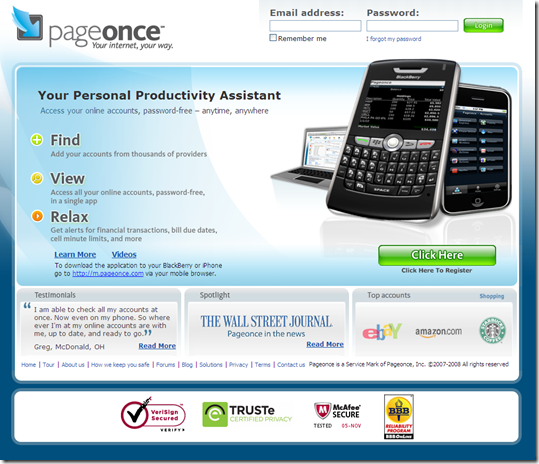 An iPhone application called A Personal Assistant (iTunes link) from PageOnce has been downloaded more than 200,000 times according to the publisher. The application is an account aggregation service that automatically downloads balance and transaction activity from financial, billing, and other service providers. In an interview on FastCompany TV (here), co-founder Guy Goldstein said that 65% of users are checking financial accounts through its account aggregation app. Assuming 100,000 total active users, that would imply more than 60,000 iPhone users tracking financial accounts via the PageOnce app (see inset). That would likely make PageOnce the third largest provider of banking info to the iPhone, trailing only BofA and Firethorn (see note 1). During the FastCompany interview, Goldstein identified one focus to be banking and bill pay transactions, and said that plans are in place to add bill pay functionality to the app. Palo Alto-based PageOnce opened to the public in July. The company also offers a Web-based version of the account aggregation service (screenshot below), but sees its core audience being smartphone users. The company launched a Blackberry version a few days ago (see homepage below, company post here). Because mobile website navigation is relatively more difficult, the allure of having all your personal and financial info in one place is stronger for smartphone users than for website users. However, users are still very concerned about handing their passwords to an unknown startup such as PageOnce. But convenience-minded consumers will do it if there are no viable alternatives from trusted brands such as banks, credit unions and card issuers. If you work at a financial institution, and you still have development dollars available, move the iPhone app up your priority list. Or partner with someone that already has an app and get your brand on that precious screen. PageOnce is actively looking for partners and has already announced three, none in the financial sector. 1. Firethorn added a mobile banking app two weeks ago (post here) that has risen to fourth most popular, behind Bloomberg, Bank of America, and Check Please, a tip calculator (see previous coverage here). 2. For more info on the mobile area, see our Online Banking Report on Mobile Banking. While making the rounds in the Finovate networking room last week, I saw an intriguing graphic on Yodlee’s big-screen monitor (see inset). 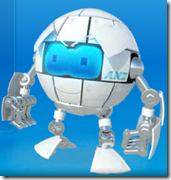 It turns out to be Qi (pronounced “key”), the robot mascot for Yodlee’s latest aggregation client, Australia’s ANZ Bank, which launched that day (press release). The new service is called MoneyManager (see screenshot below; note 1). 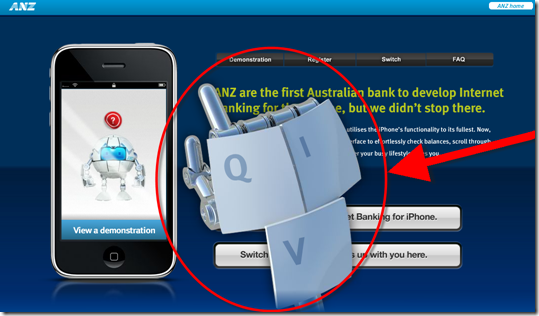 The cute little beast also appears in the bank’s new iPhone promo on the ANZ website (here). 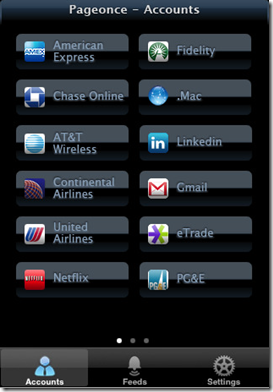 The webpage features the app running in a full-size iPhone emulator. But that’s not what you notice first. The bank uses a little programming trick to turn your curser into a GIANT robot hand (see screenshot below). It’s a little disconcerting at first, but it does get your attention and proves you are dealing with a creative enterprise. I like it. 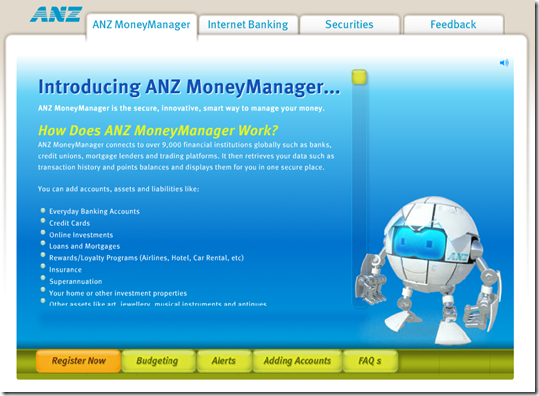 According to Rob Findley, blogging at The Bank Channel, MoneyManager can be used by any Australian and does NOT require an ANZ account relationship. 1. For more info, see our Online Banking Report on Account Aggregation. Apparently, Citibank has been testing a new investment advisory service this summer, myFi, targeting certain Citibank credit card customers. Its first online mention appeared in a frequent-flyer forum, FlyerTalk, May 31 (here) and in the personal finance forum, FatWallet, June 13 (here). The bank has been testing mileage premiums for opening a myFi account and/or increasing spending on a Citi card. The service consists of a Web-based investment area which will include trading and account-aggregation services later this year (see note 1), combined with telephone and in-person help from non-commissioned Citi Smith Barney advisors. The NY Times's Your Money columnist Ron Lieber tested the human portion of the offering in a Long Island branch and reported on it in his column today. myFi's director of financial advice is Jonathon Clements, a long-time Wall Street Journal personal finance writer who recently left the paper. If he can instill his pragmatic personal finance outlook to Citi's offering, it would help differentiate it from similar offerings. Andy Sieg is managing director of the service. 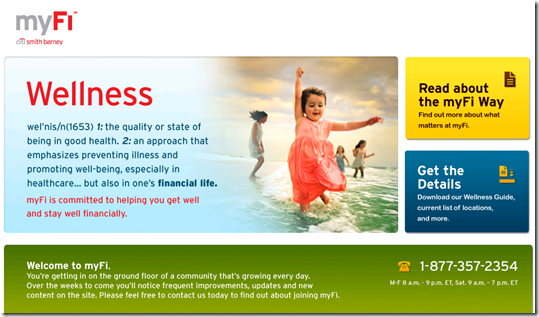 The initial creative approach is to use a "financial wellness" theme. Today, the website is bare bones (screenshot below), with a few PDF files available for download. It's clearly a work in progress. The bank should slap a "beta" tag in the upper-right corner so that it's not unfairly judged as a complete offering. 1. For more information, see our Online Banking Report on Account Aggregation. 2. According to Compete, myfi.com had 2,400 unique visitors in July, the first month with any significant traffic. 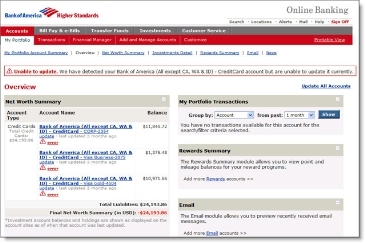 We first discussed the usability advantage of direct-to-the-desktop information delivery in the 1998 Online Banking Report, Creating the Amazon.com of Financial Services (see note 1). We called it a "meter" instead of today's widget or gadget, but its essential function was to show balance levels on the user's PC without requiring a login each time. 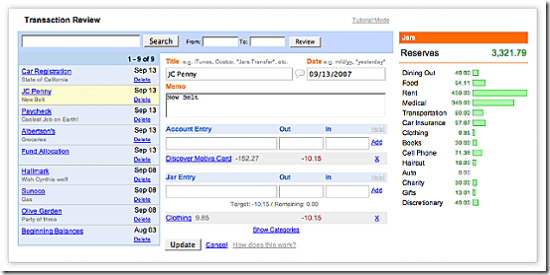 Several other personal finance companies have previously launched widgets including ClearCheckbook which released a Google Gadget on March 14 (here) and Mac Widget a few days later (here). Other financial widgets are offered by billQ, Buxfer and Mortgagebot (see previous coverage here and here). However, Wesabe is the only one streaming real-time balance updates thanks to its automated downloading of account data from linked financial accounts (aka account aggregation). Without the automatic updates, a widget is more window dressing than functional tool. Therefore, we're giving Wesabe its second OBR Best of the Web this year in recognition of its new widget which once again raises the bar for financial information delivery (note 2), if only for Mac users. 1. We last covered desktop technologies in a 2002 Online Banking Report, Grabbing Desktop Mindshare (# 85). 2. Recent OBR Best of the Web winners are covered here. Five awards have been handed out this year: two for Wesabe, and one each for Jwaala, Buxfer and Obopay. In the past 10 years, 67 companies have won Online Banking Report's Best of the Web awards. Only five companies prior to Wesabe have won the award twice: Bank of America, Citibank, E*Trade, Everbank, and Wells Fargo. Joining the increasingly crowded online personal finance space is Banzai, the brainchild of Morgan Vandagriff (LinkedIn) who envisioned the system while working for a wealth management-advisory firm, SEI Investments. Vandagriff, a 2002 Wharton biz school graduate, is positioning his firm as a financial assistant, not just a financial automation tool. Rather than sit back and let users put their finances on autopilot, Banzai induces them to spend 5 minutes every day tracking and categorizing their spending. And unlike Web 2.0 companies hoping to scale to millions of users with a handful of employees, Banzai assigns a personal coach to each user and actively encourages users to make contact. Banzai uses "jars" as the metaphor for budget categories. 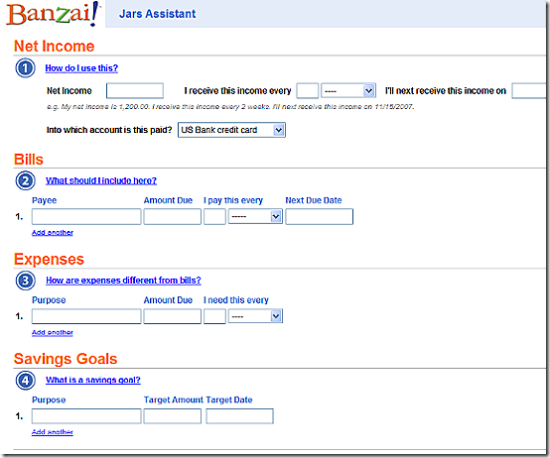 Users establish jars for every bill, spending category, and income item. Transactions are uploaded from previously downloaded bank and credit card statements using a proprietary uploader similar to Wesabe's. Entries can also be made manually. Banzai then forces users to take money for every transaction from one of the pre-established jars. It believes that it's important for users to "touch" every transaction to see how it impacts their pre-established spending plan. If a jar is empty, say groceries, then users must take money from another jar to cover the transaction. It helps users see the tradeoffs in spending. It's not a zero-sum game. Users can have their "reserve" jar go negative, signifying debt spending. Take the company tour here. The four-person company is headquartered in Provo, UT, coincidentally just 10 miles from their most similar competitor Mvelopes, a personal finance site established in 2002 and run by Finicity (formerly In2M). The company has been in development mode since early this year. It is planning an official launch (to public beta) on Nov. 12, but anyone can sign up now at its website. The company also competes with newer players, Wesabe, Mint, Buxfer, Jwaala and others and the big packaged-software players, Intuit's Quicken and Microsoft Money (note 1). Like its most-similar competitor, Banzai's business model calls for modest monthly or semi-annual fees; in this case, $4.95/mo or $29.70 for six months. The $30 fee includes a copy of a 120-page book, The Banzai Way. Banzai has a great logo, user-friendly layout, vibrant color and easy-to-read copy. The company has developed a good product tour, YouTube video, and blog – all the usual trappings of a Web startup, circa 2007. And the founder sounds very customer focused. It's unfortunate that a video game occupies the primary URL <banzai.com>. The company's <banzaiway.com> address along with the unusual spelling, will make it somewhat harder to find. I like what Banzai is doing, but I wonder, as I always do, how the company will attract users. Few people have the discipline to spend any time, let alone 5 minutes a day, managing their finances, and most of those already use Quicken or Money. And the $5/mo fee puts Banzai at a disadvantage compared to the free sites. However, Mvelopes has survived at double that rate, and if customers can be convinced it works, one caramel macchiato per month is not much to pay to keep your financial house in order. In fact, a site is somewhat more trustworthy when its business model is obvious, an important benefit in online finance. Finally, putting a a face on the product with a personal coach on call may help differentiate Banzai from the free sites. 1. See our recent research on personal finance in Online Banking Report #142/143 and #131/132. It's dangerous to hype a startup while they are still in stealth mode. After all, given the average life expectancy of a Web-based startup, this blog post could outlive Mountain View, CA-based Mint.com (see note 2). But just knowing that the company snagged $5 million in VC money, which is huge in this space, means they will be interesting to watch, even if they don't catch on. And with that kind of money, Mint has a deeper bench and can be more aggressive than other newly minted personal finance startups such as Buxfer and Wesabe (see previous coverage here). The company received money from ex-Google sales manager Aydin Senkut and first-round funding from First Round Capital. Other investors include current or former execs from Intuit, Charles Schwab, and Yahoo. Mint is building a free, simple, and secure personal finance web-app. Designed to be effortless, Mint consolidates your financial life in one place. Easily see how much you have, how much you owe, and where you money goes. 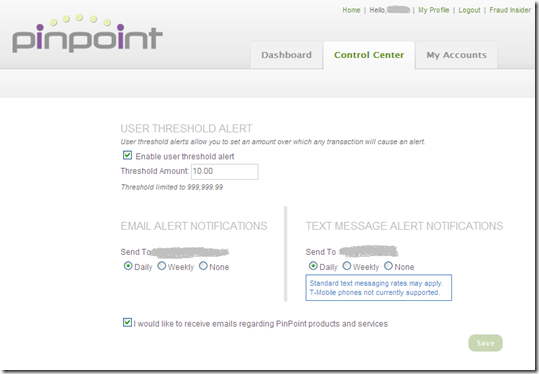 Advanced alerting notifies you before you bounce a check or forget to pay a bill. Patent pending algorithms even show you personalized ways to save and make more money. If your finances could use organization without effort, or a big improvement without a lot of work, Mint is for you. NetBanker translation: Mint will use account aggregation tools, much like Quicken, Yodlee, and more recently Buxfer and Wesabe, to load bank and credit card transactions into its web-based personal finance manager. The company will layer in meta-alerts, that will look across all accounts and notify you when balances are low, crooks are pinging your account, and so on. If you want to keep closer tabs on Mint, you can take its online survey and request to be in the private beta. And you should grab the feed to the company blog. Finally, you can see from its job postings that it is serious about finding top talent to run the company. There are positions open for both VP Marketing and Senior Product Director among others (here). 1. *Sorry, for some reason, I needed to be the first to write that headline. From now on, I promise to steer clear of mint-related puns. 2. This statement is not meant as a criticism of the company, which looks very promising. I have not seen their product yet, nor do I want to since I am currently writing a report on this space and would not want to inadvertently share any of their secrets. The report, Personal Finance & Social Networks, will be posted by the end of the month at Online Banking Report. 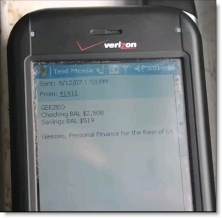 The latest entry in the mobile banking space is Geezeo, who unveiled an account aggregation/mobile banking mashup Sunday called Geezeo Mobile. Take a few minutes and watch their screencast (here), which does a good job explaining how it works. Geezeo recently changed its name from DebtFolio and still operates a credit card selector at debtfolio.com. The company also offers a student loan consolidation service, called Geezeo Student. The account aggregation is powered by CashEdge, which has considerable credibility in the banking industry, but is an unknown with consumers. 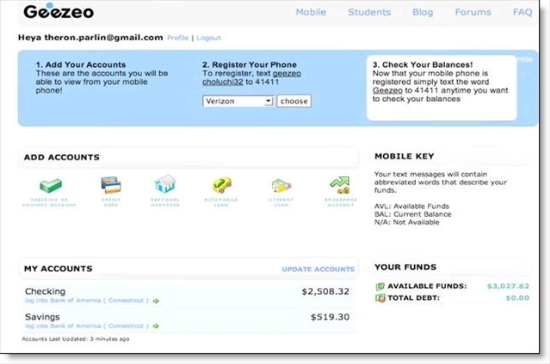 Geezeo Mobile and Geezeo Student are part of a much larger online personal finance manager that's soon to be released. Geezeo will feature solutions to help you manage your money, keep track of where your money goes, provide suggestions for improvement, help you meet your financial goals and connect with others. We have yet to connect with the founders, but according to MobileCrunch, the business model is contextual advertising. If that's true, Geezeo will need to appeal to the youth market, where bank account balances are lower, security concerns are fewer, and texting is the norm. But a better business model might be licensing the tool to banks and credit unions. In one fell swoop, the Geezeo app would give a financial institution a unique mobile banking offering, an entry into account aggregation, and an appealing platform for younger customers. 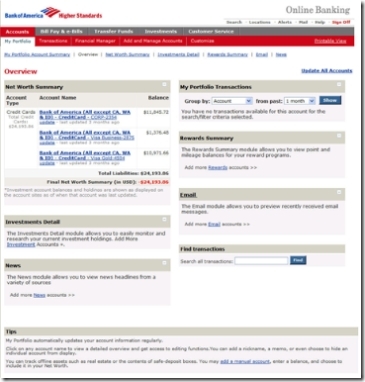 Bank of America is the first major U.S. bank to provide full online personal financial management (PFM) within its online banking service. It's an important development and one we predicted in our detailed look at online personal finance (Online Banking Report #131/132, published in September). So, in conjunction with our sister publication, we are awarding it the fifth and final OBR Best of the Web for 2006 (click here for other recent winners). The bank uses its Yodlee-powered My Portfolio account-aggregation service to deliver the PFM functions. BofA is the first financial institution to use Yodlee's new MoneyCenter module since its launch six months ago (see our coverage here). The bank has chosen to offer the full MoneyCenter suite with Net Worth Summary, Investment Detail, Transactions, Rewards, Email, and Search on the main page (see screenshot below). See Online Banking Report 131/132 for more details on Yodlee's MoneyCenter. Overall, we believe the new PFM functions are a great addition to the bank's online banking program. 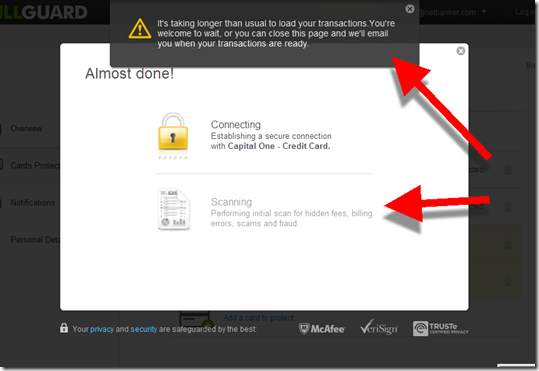 However, it still feels a bit "bolted on" to the core online banking service. For instance, My Portfolio does not yet warrant a place on the primary top navigation bar. Instead, users must click on a link in the middle of the main Account Overview screen. Once the Yodlee-powered service has loaded (which took 10 to 15 seconds in our tests at broadband speeds), it's relatively well integrated. A second My Portfolio navigation bar is loaded under the main online banking navigation. Finally, a third row displays the options available for each function in row two (see screenshot below). The pages load relatively fast as long as you stay within the My Portfolio area. However, moving back and forth between BofA-served online banking functions and Yodlee-served My Portfolio functions is a bit clunky with the 15-second delay. But the overall experience will be fine once My Portfolio is incorporated into primary navigation. The main My Portfolio page is automatically pre-filled with applicable BofA accounts; however, in my case, I was unable to update older credit card information. When clicking Update All Accounts in the upper right, error messages indicated that my Bank of America credit cards could not be updated (see screenshot below).